This creeping Mexican sage is handy because it is short and will grow in part shade as well as sun. The leaves are attractive and flower colour is scarlet. I have not found it to spread much but probably have not had it in its optimum position. Though it has a common name of eyelash sage it is one of the least hairy!!!! It is frost hardy to at least -2C. It will live, if not flourish, in very dry spots. It sets a little seed for me but can also be propagated by cuttings or division. There have been a couple of varieties in Australia but they don’t seem to be that different so that they end up getting confused anyway. 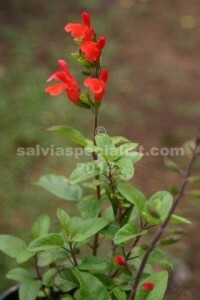 The closest salvia to it might be hirtella.